Acquisition History: The Department acquired the Musquash Swamp WMA in 2017 using a variety of funding sources including the Aquatic Resource and Mitigation Grant Program from the NH Department of Environmental Resources, the USFWS Wildlife Restoration Program, the Land and Community Heritage Investment Program, and Moose Plate Funds. Partners in acquiring this property included the Southeast Land Trust of NH and the town of Londonderry. The WMA is located on the south end of the 1,400 acre, town-owned Musquash Swamp Conservation Area. Description: Habitats include Appalachian oak-pine forest, two large wetlands, and several vernal pools. 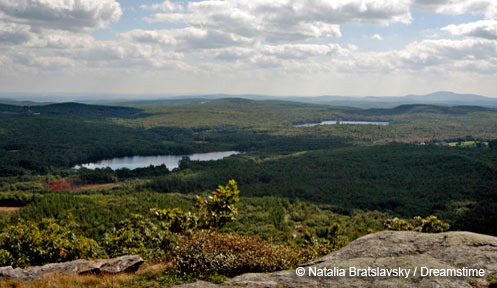 This WMA provides important reptile and amphibian habitat, and the oak-pine forest containing a significant amount of red and white oak that provides hard mast for deer, turkey, and bear. Common Wildlife: Wildlife in and around the wetland complexes include beaver, mink, otter, wood ducks, and mallards. Watch for painted and snapping turtles. Upland wildlife includes bobcat, deer, bear, turkey, and grouse. Listen for wood thrush, veery, and red-winged blackbirds. Directions: From Willey Hill Rd, head north on Preserve Drive. Go to the end of the cul-de-sac where you will find boulders lining the entrance to a woods road, which marks the beginning of the WMA. There is parking for a couple of cars in front of the boulders.